The Firehouse has been furnished and decorated with many upcycled and repurposed items. There are Wheelchair Accessible dorms. Built in 1917, HI Little Rock Firehouse Hostel & Museum is the renovated old Fire Station #2, a beautiful Craftsman-style building located in historic MacArthur Park in downtown Little Rock, Arkansas. HI Little Rock Firehouse Hostel & Museum is a 36-bed hostel that also doubles as a museum of firefighting history and memorabilia, and promotes fire safety. It is the first international hostel in Little Rock and it's wheelchair accessible. You never know who you might run into at the Firehouse Hostel and Museum, located inside—a restored historic firehouse in MacArthur Park. The 1917 Craftsman style building once house Little Rock Fire Station #2, and the charmingly restored property is filled with artifacts from firefighting history. Located in the heart of Little Rock in MacArthur Park, this hostel is close to all downtown attractions, including museums, galleries, shops, restaurants, and the vibrant SoMa and River Market districts. Captain's Room: The Captain’s room has an ensuite bathroom and is located on the ground floor. It is co-ed and can hold up to 4 guests in 2 bunks. Family Room: The co-ed and wheelchair accessible room is located on the ground floor. It can hold up to 6 guests in 3 bunks with storage lockers underneath. Dorm Rooms: The men’s dorm is upstairs and has 7 bunk beds that can accommodate up to 14 guests; The new women’s dorm can accommodate up to 12 guests in 6 bunks. To arrange for your stay at this unique hostel, call them at 501-476-0294 or visit online www.FirehouseHostel.org. CONTACT: 1201 Commerce St., Little Rock, 501-476-0294, www.FirehouseHostel.org. Are You Financially Prepared for an Emergency or Natural Disaster? ​Being financially prepared for an emergency or natural disaster is about more than just having savings set aside. Having access to critical personal and financial information will help you on the road to recovery. The experts at Freddie Mac offer the following tips for getting organized and prepared for the unexpected. Compile information.The Federal Emergency Management Agency (FEMA) Emergency Financial First Aid Kit includes fillable checklists, and is a handy and free way to compile important information, such as driver’s license numbers, birth certificates and Social Security numbers, bank accounts, insurance policies, mortgage statements, credit cards, taxes, health insurance cards, accounts, medications taken and any other health records, as well as household contact information, including landlords, doctors, schools, employers, contractors, lawyers, and insurance agents. Be sure to revisit this information periodically and update it as needed. Review your paperwork. Review your insurance policies and financial paperwork to be sure that they are current. Update any policies as soon as possible, so you are not without coverage when you need it most. After an emergency, contact your insurance agents about your policies to find out what you can expect, including an explanation of benefits. For example, many homeowners policies cover alternative living expenses that can help provide you and your family with temporary housing needs, meals and other life necessities. Seek mortgage relief. In the event of an emergency, having access to your mortgage information can be critical, as you may be eligible for mortgage relief. Get secured. Secure your property as best as possible, keeping it safe from damaging natural elements and, if you are evacuating, potential vandalism while it sits empty. Consider protecting valuables, mementos and personal information in a safety deposit box or a fire- and water-proof safe. When it’s safe to return home, document any damage to your home and belongings with photos or videos, if possible. Get smart. Unfortunately, crises tend to bring out scam artists. Be wary of post-disaster scams and anyone offering to provide you with immediate assistance for money. Government officials will never ask for money and will always show their ID badges. 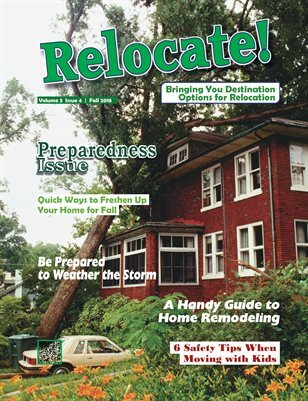 For more disaster preparedness tips and resources, visit www.FreddieMac.com/blog. Saving for a rainy day is an important step that everyone should take to prepare for the unexpected. But remember, true financial preparation for emergencies and disasters goes beyond a savings account. For peace of mind, use free online resources to get organized.